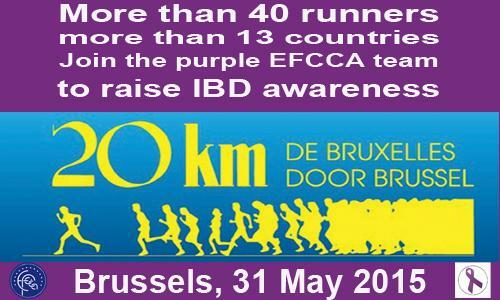 As part of the World IBD Day celebrations EFCC organised participation at the Brussels 20 km marathon in order to raise awareness about Crohn´s Disease and Ulcerative Colitis, collectively known as inflammatory bowel disease (IBD), which affect over 3 million people in Europe. The 20 km marathon took place on 31 May at 10 am in Brussels, Belgium. Starting point was at the Parc du Cinquantenaire. We had over 40 runners registered from 13 European countries including a mix of professional and amateur runners made up by patients, doctors, friends and family members. EFCCA also had an information booth at the starting point of the race. The booth was run by a team of volunteers and supporters wearing the purple t-shirts of the EFCCA team and colour of World IBD Day and distributed purple ribbons and materials to inform people about IBD and about EFCCA activities. EFCCA would like to thank the 20Km Brussels marathon staff for their support and assistance.